Case-Shiller reported that home prices hit their lowest pace in two years. According to the Case-Shiller 20-City Home Price Index for October, home prices fell in 10 cities, rose in eight cities and were unchanged in two cities. According to its 20-City Home Price Index, Case-Shiller said that home prices dropped by 0.10 percent to a reading of 4.50 percent year-over-year as compared to September’s reading of 4.80 percent year-over-year. Analysts expected home price growth to drop to 4.70 percent in October. David Blitzer, chairman of the Index Committee at S&P Dow Jones Indices, said that 2014 could finish on a strong note with price growth accelerating in 2015. Home price growth hasn’t hit double digits since April, but there is encouraging news on the horizon. More than half of states’ average home prices are set to surpass housing bubble peaks in 2015. Through October, home prices were approximately 15 percent below a 2006 peak. Higher inventories of available homes and lower mortgage rates are seen as stabilizing influences on housing markets, and could also encourage more buyers into the market. The National Association of Realtors® reported that November pending home sales rose to a reading of 0.80 percent from October’s reading of -1.10 percent. The seasonally-adjusted index reading for November was 104.8. Lawrence Yun, NAR’s chief economist noted that steady economic growth and hiring contributed to home buyer confidence. Regional readings for pending home sales were +1.40 percent in the Northeast, +1.30 percent in the South and +0.40 percent in the South. Pending home sales declined by -0.40 percent in the Midwest. 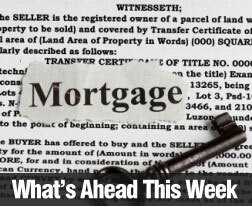 Fixed mortgage rates rose last week. Freddie Mac reported that average rates for 30-year and 15-year mortgages rose to 3.87 percent and 3.15 percent respectively; the average rate for a 5/1 adjustable rate mortgage was unchanged at 3.01 percent. Discount points for all types of mortgages were unchanged at 0.60 percent for fixed rate mortgages and 0.50 percent for 5/1 adjustable rate mortgages. Weekly jobless claims rose to 298,000 new claims against expectations of 290,000 new claims and 281,000 new claims filed the previous week. This was the highest reading since Thanksgiving. Analysts said that seasonal hiring fluctuations and the volatility of week-to-week claims cause weekly reports to be less reliable than the four-week rolling average of jobless claims, which fell by 250 claims to a reading of 290,750. Continuing claims fell by 53,000 to a reading of 2.35 million in the week ending December 20. This reading was close to a 14 year low. Overall, analysts viewed stronger labor markets and economic growth as positive signs for 2015. Next week will resume a full schedule of economic events including construction spending, ADP employment, Non-Farm Payrolls and the national unemployment rate. The Federal Reserve will release the minutes from the most recent meeting of the Federal Open Market Committee (FOMC). This entry was posted in Consumer Tips, FHA, Housing Analysis, Mortgage Rates and tagged Case Shiller/ HPI, Financial Reports, Housing Market, Mortgage Rates. Bookmark the permalink.